It means less pressure, added Sarah Ritter of Heyworth. Also at the home-school prom last Saturday, few of the young ladies had newly purchased gowns nor young men with rented tuxes. There were four pages of rules for the event, and one was that you feel no need to spend a pile of money to attend. About 40 teenagers attended the first-for-here event, held at the Normal Community Activity Center. They took the event seriously without it being the expensive, date-driven night typically associated with proms. Ratcliff and two of her friends assembled at her house in Normal about noon for hours of work on make-up, hair and attire to ensure that they would be pictures of grace. The boys weren't so intentional, or they were less willing to admit it. Meghann's younger brother, Marcus, pulled a dark, dapper suit from the closet. Time to prep, he estimated: "15 minutes." 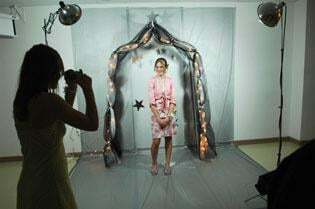 The Crossroads Area Home School Association organized the prom. Started in 2005, the association supplements home-school curricula with extracurricular and learning programs. Most of the programs - all of it, in the case of the formal - rely on parents. Becky Ritter, Sarah's mother, put it this way: "In the home-school community, if something is important to you, you make it happen." Mrs. Ritter had a blast at her own prom, she said, and she wanted her children to have that chance. Plus, she said, "to me, it's a coming of age." So she was among those who stepped forward to make the prom happen. A committee of six parents and five students oversaw details. The age range of those attending was 14 to 19. A person had to be home-schooled or come with a home-schooler. The team transformed a fairly generic room at One Normal Plaza into a sparkling ballroom fitting the theme "Once Upon a Star." Volunteers arranged for a punch fountain and a chocolate fountain; in a picture area, Becky's husband, Kevin, was the evening's photographer. Two home-school graduates, now in college, were recruited for key roles. Ben Ritter, from the above-mentioned Ritter family, was the disc jockey. Sam King was emcee. As the 8 p.m. starting time neared, most of the teens had arrived and King was readying an agenda that included door-prize gifts from local businesses, an Olde English circle dance, senior recognitions and an Armenian dance. His goal: "Keeping everyone active; keeping things flowing." This seemed daunting as dateless guys gathered at one corner of the room and dateless ladies at another, and with couples keeping to themselves at tables. But Ben Ritter had been busy downloading MP3 files. "Fun and danceable, a variety of genres and very clean" is how he described the mix for the night. With much of the crowd coming from Christian homes and being themselves Christian, there was no place for dirty music, he said, but he added that just a couple of the songs were from Christian artists. His sister, Sarah, said there was no place here for dirty dancing of the kind she witnessed at a public high school dance - in the middle of the floor, with teenagers on the outer areas of the dance floor conspiring to block sight of dirty dancers from chaperones. At the home-school prom, Ben started the night with waltzes, and King urged those with no experience to fake their way through. Parents took pictures and some took their children to the floor for a dance. Several numbers later, the room started getting rowdy. "All right, Ben. Go!" King said, and Ben popped on some techno. The floor filled. Cheers, hoots and clapping ensued as Ben and one of his college buddies, Daniel Ramirez of Chicago, engaged in a break-dance showdown. Luke Meyers, a 17-year-old from Minonk who ordinarily doesn't dance, showed some credible moves with his date, Cyleste Montgomery, 16, of Rutland. "I'm just kind of winging it," Meyers said during an interlude. Within the opening half-hour, teens were hustling to the photo area for group pictures, couples pictures and solo shots. The party was on, and one has to assume it progressed from there, although a full account of events is only for the teenagers to tell. At 8:30, as promised, the emcee made an announcement: It was time for all adults, minus the chaperones, to be on their way. These teenagers live with their parents and go to school with their parents. Some needed them for a ride to the ball. Nevertheless, the teenagers shared their night with each other.